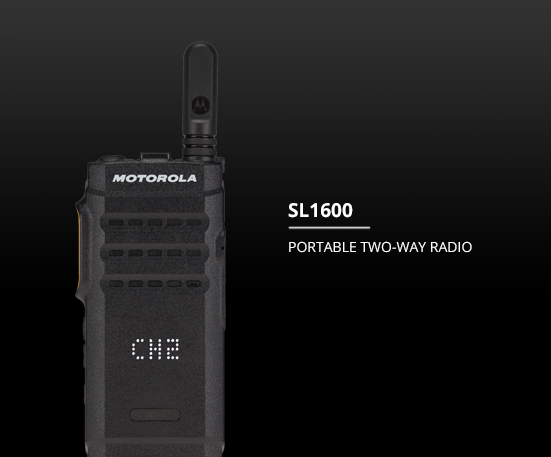 The Motorola Solutions MOTOTRBO SL1600 digital two-way radio provides reliable push-to-talk communication for the mobile, everyday user in an ultra-slim and rugged profile. 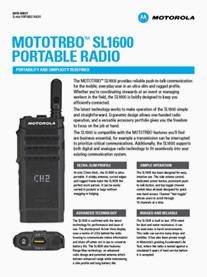 Measuring only 22mm thick and weighing just 169g the MOTOTRBO SL1600 is ultra-portable. With a stubby antenna, curved edges and rugged frame the SL1600 the perfect work partner carried easily in pockets or bags without snagging or bulging. Designed for easy and intuitive use, the Motorola Solutions MOTOTRBO SL1600 has a side volume control, dedicated power button, prominent push-to-talk button, and top toggle channel switch to enable quick one-hand access. Channel “fast toggle” allows users to scroll through 10 channels at a time. The Shatterproof Active View display uses a matrix of LEDs behind the radio housing to communicate radio information and shuts off when not in use to conserve battery life. The SL1600 features range max technology: an advanced radio design and patented antenna which delivers enhanced range while maintaining a slim profile and long battery life. The MOTOTRBO SL1600 two way radio is built to last – IP54 rated for dust and water resistance; it can be used even in harsh environments. This radio can survive many drops and tumbles. It has also been proven robust in Motorola’s gruelling Accelerated Life Test, where the radio is tested against a simulated five years of hard service before it is accepted. Pair with the MOTOTRBO Job Ticketing Application to make this digital two way radio the ultimate employee assistant.